Writes "Kompyulenta" , a British study, which was also attended by historians, literary critics and phytotherapeutist showed that teeth whitening and wrinkles have been popular among fashionistas Renaissance. That's right, according to Burke, can be attributed to timeless fashion for a smooth face and hands, white teeth, bright lips, rosy cheeks, no body hair and fresh breath. 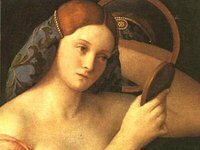 The study also showed that women XV-XVII centuries used the recipes collected by the Countess Caterina Sforza in The Book of the experiments. And many of them later moved to the "Book of Secrets" - a series of guidelines with recommendations for preservation of health, beauty and household management. That is the advice handed down from generation to generation and eventually reached our days. Some recipes about that, how to hide the defects of skin caused by diseases of the time, for example, smallpox. So, ladies of the Renaissance, it was recommended to use white lead to give the skin a white frosted shade pterokarpus sandal was to serve as guidance for the rouge and coloring lips. A face mask should prepare on the basis of oatmeal, lemon juice and egg white, write " The News of the Week . " Quicklime and arsenic were used to remove unwanted hair and skin fresh walnuts - for their coloring. In this case, scientists have noted that although the cosmetics used mostly by women, the men of those times, too, sometimes use different tricks to improve your appearance. For example, they dyed his hair and beard, and tried to cure for baldness.